My daughter recently finished Diary of Anne Frank. I asked her to share her thoughts about the book with our co-op. This is what she shared. Have you ever wondered if something you wrote would be read by future generations? Did you ever think about the fact that you may be known as part of “ancient history” someday? If you knew that, sometime in the future, millions of people would be reading what you wrote, what would you say to them? My paper is about someone whose diary is her legacy, a diary that has been read by millions all over the world. 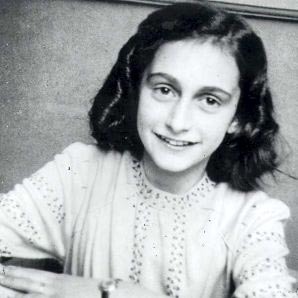 Anne Frank was a sensitive, outwardly vivacious, opinionated, and extremely intelligent Jewish girl, who lived during the tumultuous chaos of World War II. Her Jewish heritage was enough to place her life in danger, so in 1942, when she was thirteen, she and her family fled their home in Amsterdam, Holland to seek refuge in secret rooms behind her father’s business warehouse. They called their hiding place the “Secret Annexe”, and it can still be visited today, if you care to go to Holland. They lived in these secret rooms for over two years, until they were betrayed by a neighbor to the Gestapo. In total, there were eight Jews who shared the secret rooms: Anne, her older sister Margot, her father Otto, her mother Edith, and the Van Pels family, Hermann, Auguste, and their son Peter. Fritz Pfeffer, a dentist, joined them a few months into hiding. During their time of hiding, Anne wrote a detailed account of her experiences in the Secret Annexe, and what she thought of the people who shared the hiding place with her. She thought her father a patient hero, her mother an anxious, quick-tempered, but well-meaning woman who never understood her daughter, and her sister the model of meek goodness. She disliked the fastidious, stubborn, and self-absorbed Fritz Pfeffer. Anne loathed the chattering, gossipy, complaining nature of Mrs. Van Pels, frequently writing harsh, uncomplimentary descriptions of her latest follies. Anne thought Mr. Van Pels an irritable, pushover husband who was forever quarreling with his wife. She thought their sixteen-year-old son Peter a quiet, rather uninteresting boy, but later on, she found him much deeper and more attractive than she first supposed. Over the course of their time in hiding, her relationships with her family are strained and tested, always underscored by Anne’s belief that they never understood her, or gave the benefit of the doubt. This was exacerbated by Anne’s habit of saying exactly what she thought, which garnered rebukes and lectures from everyone else in the house. Eventually, Anne confided her frustration to young Peter Van Pels, and found to her surprise that he felt the same way about his parents. As the diary progressed, Anne described how their friendship and mutual confidence deepened over time, how they fell in love, and finally kissed. Interestingly, the only times Anne described being happy were during the time when she was friends with Peter. Her perspective entirely changed, and she became far more attuned to the feelings of others. The beauty of nature outside her window thrilled her, and she described being indescribably happy and grateful to God for her blessings. However, as time went on, she began to have doubts, brought on by a better understanding of her newly adolescent self, and the behavior patterns of those around her. Her diary ends with her yearning to become something more, and to be understood for the outwardly vivacious, but inwardly vulnerable and thoughtful person that she was. I had mixed feelings about this book. Initially, I strongly disliked Anne, as her character, though intelligent, perceptive, and honest, was also extremely vain, arrogant, selfish, and judgmental. It didn’t help that she was a huge flirt in the beginning of the book. However, in spite of myself, I began to like her. Anne Frank lived up to her last name, and wrote what most of us only think. Her biting sarcasm is very funny at times, and her descriptions are often quite accurate. However, she softens a good deal, and her sensitivity is redirected and turns into a greater concern for others. Her writing talent is obvious, and well beyond her years. Moreover, the book itself is an honest, yet timeless snapshot of the universal struggles of young girls going through adolescence. She also writes many entries on the political events around her, and provides a close-up look at how the war affected her people. It is quite easy to see why her diary is such an enduring classic. Now is the question, what happened to Anne? After she and the other Jews were betrayed and captured on August 4, 1944, they were taken to Gestapo headquarters in Amsterdam and imprisoned. On September 3, the same day that the Allies captured Brussels, these eight were among the last shipment of a thousand Jews to be sent out of Holland. They were herded aboard a train which took them to Auschwitz, the notorious concentration camp in Poland. When they arrived, the men and women were separated, which was the last time that Anne’s father saw his family. She and the other women with her were forced to work twelve hours a day digging sod, only to be locked into a crowded barracks at night. Surrounded by the threat of illness, which automatically meant the gas chambers, and guards with machine guns, the prisoners were eventually deadened to their circumstances, and traveled about like sleepwalkers, oblivious to the horrors, feeling nothing. A survivor recalled from the camp, “But Anne had no such protection. I can still see her standing at the door and looking down the camp street as a herd of girls was driven by to the crematory, and Anne watched them go and cried. And she cried also when we marched past the Hungarian children who had already been waiting half a day in the rain in front of the gas chambers because it was not yet their turn. And Anne nudged me and said: ‘Look, look. Their eyes…’ ” In October of 1944, Anne, her sister Margot, and Peter’s mother, Mrs. Van Pels, were moved to Belsen in Germany. Left alone in Auschwitz, Anne’s mother died in the infirmary barracks. Anne’s father Otto watched Peter’s father, Mr. Van Pels, taken off to be gassed. Fritz Pfeffer, the dentist, died in another German concentration camp. Peter Van Pels was brought along by the SS when they left Auschwitz to escape from the advancing Russians. He was never heard from again. His mother died in Belsen, where Anne’s sister, Margot, died around the beginning of March, 1945. Anne Frank died of typhus very soon after her sister. Another survivor recalled, “Anne, who was already very sick at the time, was not informed of her sister’s death, but after a few days she sensed it, and soon afterwards she died, peacefully, feeling that nothing bad was happening to her.” She was not yet sixteen. The war ended in May of 1945, a few months after Anne’s death. Her father was the only survivor of the group of eight Jews. He published Anne’s diary as a memorial, and his wish is fulfilled, as her story shall never be forgotten. I will tell her. Thank you for your kind comments. It is such a painful time and event to read about. I think it should make us weep so we never forget what was done to so many. I waited for this book until my daughter was old enough to process it. She is an older teen. We have done other books on the holocaust for my younger children. I appreciate your note. How incredibly well written and powerful!